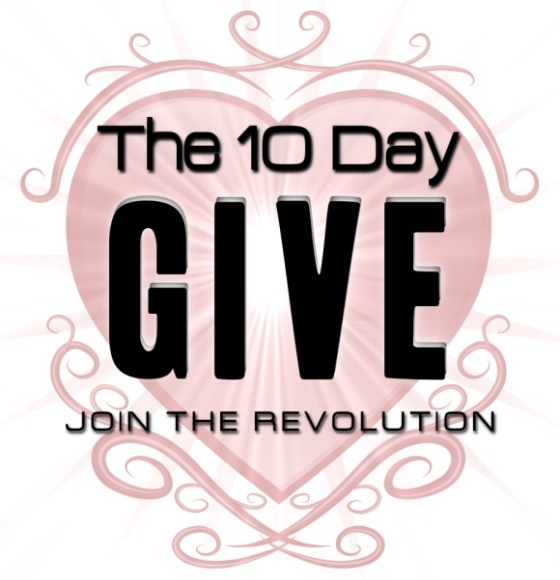 The 10 Day Give – Join Me! Won’t you join me in THE 10 DAY GIVE? This is my 3rd year and I have already been thinking of ideas for what I will be doing for those 10 days! The 10 Day Give is a challenge that is designed to help us get our minds off of ourselves and start thinking about how we can help others. The thing is, I think most people really want to make other people’s lives better, but with everything going on all around us all hours of the day, we just don’t get a chance. This is an opportunity to choose, on purpose, to give of ourselves. There really are hundreds of opportunities that we overlook each day. My goal is to just grab hold of one of them each day. For some people that means giving money, for others time is far more precious than money, and for others it may mean their expertise in an area. But, no matter who you are, we all have something to give. It could be taking someone out to lunch, it could be babysitting for an overworked mom, it can as simple as giving your precious time by taking your mom to the park to talk. There are no rules, no judges, and no right or wrong ways of completing the challenge. But, I encourage you to sign up for the challenge and decide to give whatever you can – it’s only for 10 days. And who knows, maybe it will become a habit. So, why not decide to take 10 days to give something to a different person, each day. It doesn’t matter what the gift is, how much it costs, who it is given to, or how it is given. The point is to just to give – on purpose. We hope you decide to join us. If you would like to join THE 10 DAY GIVE, sign up on their website http://christianpf.com/10daygive/. You won’t regret it! If you would like to see some posts about my previous 10 DAY GIVE activities, just click on the year, then October and those posts will be listed. 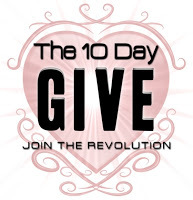 Stay tuned starting October 1st, for postings about my 10 DAY GIVE challenge!